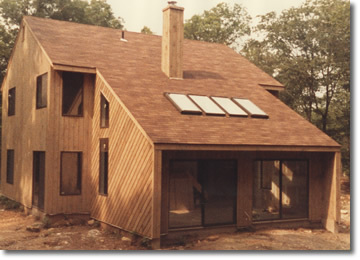 "Back in 1995, we first used Timwood Homes to build our modified colonial home in Colchester, CT. It was our first home and everyone had horror stories about builders. We could not have been happier with our experience with Timwood. The carpenters and subcontractors all made intelligent suggestions and we ended up with a better house than we had planned. 2 years ago, my parents needed an addition. I insisted that they use Timwood and voila! another satisfied customer. In 2008 we finally decided on an addition to our home over a pool. 13 years and 2 kids later, our house felt too small for our needs and Timwood was our 1st and only call. The following pictures don't do justice to the beauty and satisfaction of our addition, but we wanted to share them anyway. We wouldn't entertain another builder at half the price. We LOVE our Timwood home!" As you know, we are now at the point of having reached the completion of the shell for our Summer cottage on Amston Lake, which is the part of our project your company was contracted to assist us with. Barbara and I would like to take a moment to share with you our perspective on how the project went and how your team has assisted us in getting to this point. 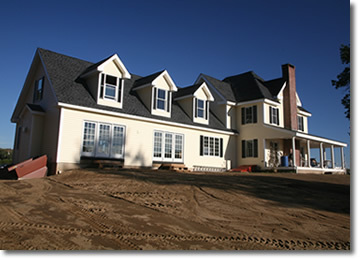 To begin, we are entirely satisfied with Timwood Homes and all of its associates. Everyone conducted him or herself in a friendly and professional manner. We would like to specifically note our experience with several of your employees and contractors. Darlene has been a pleasure to work with. She patiently worked with us as we searched for a builder, settled in on a design, and made our personal adjustments before embarking on this project. Throughout the shell building phase, she was there every step of the way by assisting me at every turn. 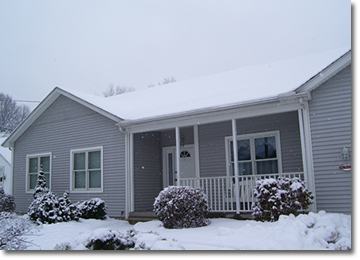 As the project progressed, we needed to make several changes including, the addition of a walkout basement, window placement and style, and adjustments to the dormer. Darlene worked with me to address these quickly. Although financial adjustments were needed, Barb and I felt that the adjustments were fair and reasonable. The rest of your team is equally professional. 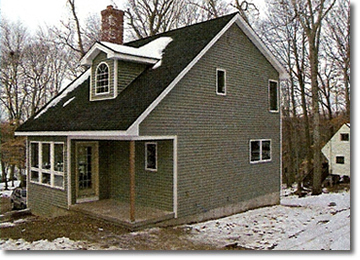 While discussing the project with Bill as he framed the cottage, I was able to work easily with him to make decisions on details such as the size and placement of the dormer, placement of windows, roof line adjustments due to the placement of the chimney and other small items. His knowledge of the business and attention to detail is remarkable. Bill also did something very special for us - he let our son Cory assist him. This is an experience Cory will never forget. Each day Cory continues to talk about how much he enjoyed it. So much so, he is contemplating a career in house framing. Another person to note is Wally. He did a wonderful job siding the cottage. His attention to seam placement, trim around the porch, windows and dormer is extremely tight and precise. Everyone who has seen it comments on how great it looks! In addition to your shell team I also had the pleasure of working with Tony and his team on the chimney and wood stove area. He too is extremely skilled. We are equally pleased this as well. All said and done, Barb and I are very pleased with the contribution your team has made on our project. You've got a great team there and we would highly recommend Timwood Homes to prospective buyers." was, in fact, first constructed by Timwood Homes back in 1985. We cannot praise enough the workmanship that your framer Bill Ganley did for us. His devotion to the project and customer service is exemplary. Tim, as you know, this is the fourth structure that Timwood Homes built with us. You, along with Darlene have the ability and high business standards that are a rare find in todays fast paced world. "When you built our home for us, you built on a 11x28 screen enclosure. 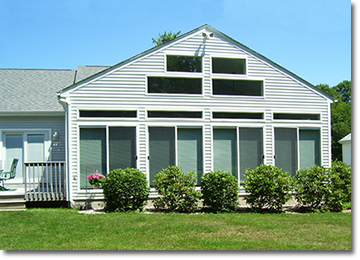 We had it converted to a closed sunroom just this past Spring. Ken and I are very happy with our home, and have not had a single problem. 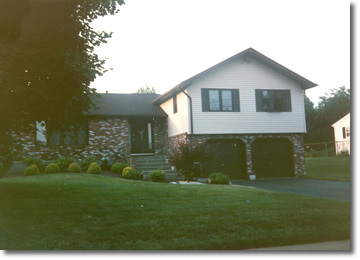 As you know, this is the third home that we have built with Timwood, so you know that we are satisfied customers." 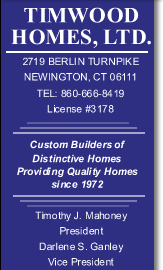 I wanted to thank you, Bill and Darlene for a wonderful home building experience. Bills attention to details and wealth of building knowledge has made me feel as if he is building his own house. As a first time home owner / general contractor, I couldnt possibly have a better group of professionals help guiding me through this process. 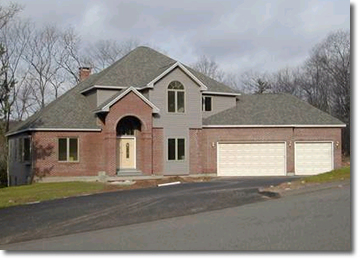 I have received countless praise during and after the building process on the precision and quality of Bills work. It was totally worth the long wait to have Bill as the primary framer for my dream house. Not only I have received a top notch building, I have also gained a group of wonderful friends. I believe that is the ultimate home building experience." "Tim, it has been a wonderful experience for both Martha and me as we watched the dream of a lifetime come to frution. It could not have happened without you and your able staff. Your knowledge of building and construction techniques was invaluable. We are especially indebted to Rejean Pelletier and his helper Scott Small, they did a superb job erecting the frame under sometimes very adverse conditions. We had to shovel several inches of snow out of the house at least five times. On the few occasions we had to call your office, it was always nice to hear Darlene's pleasant voice on the phone. She was always very accommodating and helpful. I hope this finds you hale and hearty and ready fro the new year. Martha and I want to extend our thanks and our gratitude for all you have done to help us realize our dream. It's a great feeling to reflect on the various stages of construction, from planning to the certificate of occupancy, and say "This is just what we wanted." There isn't much that we would change, wee are indeed happy with what we got." Tony and I would like to extend our appreciation for making our dream house a reality! From beginning of construction to end you were both proficient in assisting us in choosing materials, staff and especially for guiding us through all the red tape. You never made us feel left in the dark during the entire project. You kept us apprised of what was going on and you took the time to site down with us to explain the whole process. We appreciate all the time you devoted into our project and it is quite evident by all the compliments we've been receiving, on the workmenship and the whole house. The carpenters, the roofers and the siding men were all a pleasure to deal with. You were instrumental in making our dream a success. Once again, a heartfelt thank you. With the dust finally settling (literally!) on our move, I wanted to take this opportunity to thank you both for your work, advice and friendship in helping to make our recent new home building a great experience and more importantly an impressive result. We began this project with much trepidation and concern, having heard numerous "horror" stories from many people who ventured to build their own "dream." Fortunately for us, none of those experiences materialized. We can truly say that the process -- from start to finish -- went smoothly and, for the most part, was enjoyable. I am sure much of our good fortune was a function of our timing -- a slow market for both subcontractors and suppliers made our (and your, we're sure!) lives easier and the project more affordable. But clearly, alot of the credit must also go to both of you for your help and guidance. The subcontractors you recommended were all "top notch." Their workmanship received high praise by many who followed the home's progress. And, your many suggestions -- expansion joints where none were planned, a trayceiling instead of cathedral in the family room, bluestone for the hearth, the carefully planned sidewalk, positioning basement support columns to maximize usable space -- and countless other little changes have all come together to make the finished product a beautiful home and tribute to Timwood's quality work. Our family hope to enjoy many years of happiness in our new home and you can be assured that you will always be remembered for your special contribution. Thank you both and please don't hesitate to pass our names to any prospective clients in search of references. An enthusiastic well deserved endorsement awaits! P.S. By the way, none of this would have ever come together without Darlene's help! Please pass along our thanks to her as well." Well, this letter is certainly long overdue. But Nick and I want to express our thanks to you for your help, patience and professionalism during the construction of our home five years ago. Building a home can be such an unnerving experience, but your assistance through every stage assured us that things were under control. We never could have made it without your help. As you can see, we are very happy with our "dream home"
Enclosed you will find a photograph of our house which we had made for you. Please keep it for your records. And thank you, your fine crew of people and subcontractors for a job well-done. Our house is everything we hoped it would be, and more! We love it! From the first help we received from Lillian, to your advice on construction decisions, and Bill's expert planning and scheduling; from Butch's foundation to Walt's framing crew, through Andy's plumbing, the roofers who were in and out before I knew it, Roger and Mike's excellent siding work, Andre's tornado of sheetrockers, and Martin Cabinet's gorgeous kitchen, the building process went smoothly. You helped us keep on schedule and get into the house on time. The result is visible in the photograph, and if you ever need a reference, I would be happy to supply one. We're still working on the floors, painting and interior trim. We've waited eight weeks for a mason to get the bricks up here and build the trombe wall. He's supposed to show up the end of this week. We're working on the yard and a deck for the front entrance. In a couple of weeks we hope to have settled on ideas for our garage and family room above it, and will be coming up to discuss our ideas with Lillian and to order the blueprints. After all, March 1 is not that far away."